One of Swindon’s most important arterial routes has reopened to traffic following major improvement works. Akers Way has undergone extensive reconstruction work, which has resulted in major modifications to the concrete road base that will add decades to the lifespan of the road. The scheme has also made significant improvements to the existing on-road and off-road parking arrangements as well as a new and improved section of cycleway. 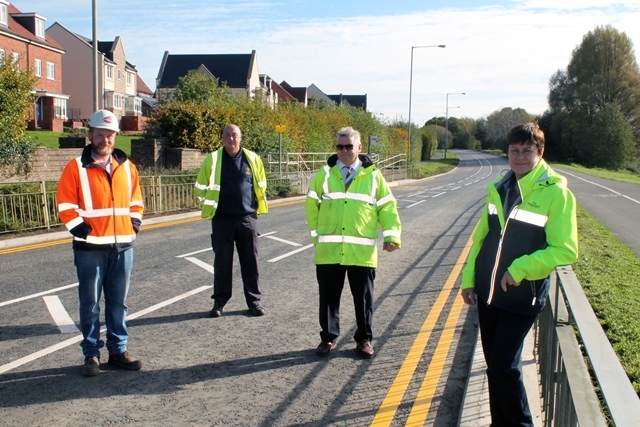 The mile-long stretch of carriageway has been upgraded in five sections and contractors have just completed the final stretch of road between Cheney Manor industrial estate and Nova Hreod Academy. Akers Way now has a hard wearing and longer lasting tarmac surface, as well as a much improved and structurally sound concrete base to support the road. Over 5,000 tonnes of specialist Polymer Modified tarmac, which is designed to resist cracking, was used in the top two layers of the road. The work took longer than expected after a large number of additional defects were uncovered in the concrete road base during the first and final phases, which couldn’t have been foreseen by the Council’s contractor. In total, 200 individual repairs were made to the concrete road base, ranging in size from 1m2 to 580m2. 390m3 of concrete was poured into the road structure as part of the bespoke structural patching design and 3.7 kilometres of new kerbing has been laid. The project has taken circa 10,500 hours to complete, and was undertaken by a local contractor employing local people. Cllr Mary Martin, Swindon Borough Council’s Cabinet Member for Communities and Place, said: “This project has transformed what was arguably one of the worst road surfaces in Swindon into one of the best. “The Council is committed to improving the borough’s highways network and the investment in Akers Way is the latest in a series of schemes to upgrade key parts of our infrastructure in line with the town’s continued growth and the increasing number of vehicles on our roads.